– Improving healthcare and changing the world. The Masanga project in Sierra Leone has moved from post-war chaotic conditions to sustainable models. The models can hopefully solve some of the many health problems that are characteristic of third world countries, and especially for Sierra Leone. Nobody has patented the concept of sustainability, its content and significance. It gives us the freedom to work innovatively with the concept and make suggestions to what such a model may contain. It is therefore a pleasure to welcome you all to this symposium, where we address some of the challenges in the world with basic access to healthcare and essential surgery. It requires new ideas to find solutions for the fragile health systems these countries are dealing with. How can we help to undertake this task? Health workers, researchers, universities and other educational institutions as well as organizations and government partners all share the opportunity to participate and contribute to further improvement. Together we can generate development – and together we create life! Founder of Masanga Hospital Rehabilitation Project. 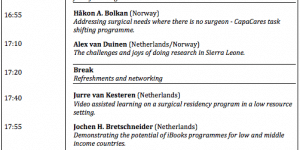 MD, MMPH, PhD Fellow NTNU, surgical trainee St. Olav’s Hospital, Trondheim, Norway. Alex is a surgical specialist trainee and has 3,5 years of working and research experience in Sierra Leone. He is a board member of CapaCare, and was the first international coordinator of the programme in Sierra Leone. He is currently performing his data collection of the largest prospective study examining quality of surgical care provided by non-physician clinicians. MD, Junior Doctor at The Com petence center for Transcultural Psychiatry (CTP) part of the Mental Health Services in the Capital Region of Denmark. Caroline is a former board member of IMCC – a health oriented youth NGO, based in Denmark and former Youth Leader for the Danish Youth Council (DUF) involved in a partnership with Rwandese medical students. She has trained medical students worldwide in project management through the International Federation of Medical Student’s Association (IFMSA). In 2017 she represented IMCC and the national and international youth during the Commission on the Status of Women (CSW) in New York. She graduated in 2017. Håkon recently defended his PhD thesis “Addressing Surgical Needs Where There is No Surgeon -Status of Surgery in Sierra Leone, Safety and Future Contributions of a Surgical Task Sharing Training Programme, and Surgery as an Indicator of Hospital Function During the West African Ebola Outbreak.” He has been engaged with operational programme activities in Sierra Leone since 2007 and research since 2012. During the West African Ebola outbreak in 2014-16, he was the lead for a Norwegian Foreign Medical Team in Sierra Leone as part of the UN Mission for Ebola Emergency Response. Dr. Bolkan is a member of the WHO’s Global Initiative for Emergency and Essential Surgical Care programme. Jochen started working as an ENT surgeon at the University of Utrecht in the Netherlands in 2002 after completing his clinical training in Germany. In 2004, he enrolled in the VU University Medical Center in Amsterdam to further specialise in Sinus Surgery and Pediatric Otolaryngology. Jochen is an Apple Distinguished Educator, and has together with a team written a series of interactive books on the Dutch medical curriculum. These 100 books will be published for free on the iBooks Store in the Netherlands in 2018. Jonathan has been president of Tropical Medicine residents (TROIE). He was working for Medecins Sans Frontieres in DR Congo until he started as Medical Officer in charge of Masanga Hospital in oktober 2017. Jurre studied medicine at Leiden University and graduated as a Global Health and Tropical Medicine (GHTM) doctor in 2013. From 2014 – 2016 he was deployed to Sierra Leone as an MD GHTM for the Danish Masanga Group. There he experienced the outbreak of Ebola. Currently he is a third year resident general surgery and setting up a research project to evaluate the use of video learning in a surgical training program. MD, MPH, PhD, Associate professor at the Faculty of Medicine, Lund University, consultant paediatric surgeon at Skåne University Hospital, Sweden. Lars has a PhD in international child health and is director of global paediatrics at the Faculty of Medicine at Lund University, Sweden. He has an MPH from the Havard School of Public Health and was a Paul Farmer Global Surgery Research Fellow in the Program in Global Surgery and Social Change at Havard Medical School. Lars is a member of the WHO GIEESC and was co-chair for the Lancet Commission on Global Surgery. Professor of Tropical Medicine and Travel Medicine at the University of Amsterdam – Academic Medical Center. Martin is clinician-researcher and conducts research into health problems arising from infectious diseases in several sub-Saharan African low- and middle-income countries. The focus of his research is primarily on the prevention, diagnosis, clinical aspects and treatment of malaria, drug-resistant tuberculosis and co-infections. Martin is the designated Director of the Masanga Medical Research Unit. With more than ten years of experience, Noemí has worked in research in several laboratories around the world. After obtaining her PhD at the Universidad Autónoma of Madrid and driven by her great interest in the study of tropical diseases, she worked as scientist at CERMEL, a leading research center in Gabon, and at the department of Parasitology of the Leiden University Medical Center in the Netherlands. Last December she came back from Masanga Hospital in Sierra Leone, where she has worked as head of the laboratory for the past two years. MD, PhD and surgical resident and post doc at Department of Surgery Aarhus University Hospital. Susanne pursued her interest in health care in developing countries as a medical student through IMCC (International Medical Corporation Committee), which soon led her to Masanga Hospital and the organization Masanga DK. The two organizations teamed up in 2008 creating a therapeutic feeding center at Masanga Hospital and with is completion, Susanne joined the board at Masanga DK as well as the international board of Masanga. She has been medical coordinator of the Masanga Hospital Rehabilitation Project for several years as well as vice-chairman in the Danish organization before she took over as chair of Masanga DK in 201? MD, MPH, MBA, Lead for the Emergency & Essential Surgical Care Programme, World Health Organization, Geneva. Walt’s primary responsibility is fulfilling the mandates of WHA Resolution 68.15 on ‘Strengthening emergency and essential surgical care and anaesthesia as a component of universal health coverage.’ Dr. Johnson is MD from Loma Linda University, California, had neurosurgery residency at SUNY-Brooklyn, and was Vice-chairman of Neurosurgery at Loma Linda University before joining WHO fulltime. His involvement with Global Surgery include teaching as visiting professor in Hangzhou, China for several years, being directly involved in developing general surgery residency training programs throughout Africa, and training of African physicians to become surgeons.